Fender Jazz Bass ( J Bass ) Neck & Bridge Set: Dual-Inline Hum-cancelling - deep tone - strong lows and low-mids [Original Bass]. The 59J1 L/S is the Fender Jazz Bass ( J Bass ) replacement pickup set with a 'long' for the bridge and a 'short' for the neck. The set is highly respected by musicians and luthiers alike for its deep tone, strong lows, low mids tone. They feature a dual in-line hum-canceling design. The "original series" bass pickups with passive designs. They are cast in epoxy to remove unwanted feedback and microphonics. The lengths of the neck and bridge pickups in the original J-basses are not equal. The neck pickup is 3-5/8" long which is slightly shorter than the bridge pickup which is 3-3/4" long. Some modern designs, however, use two 'long' bridge-length pickups. 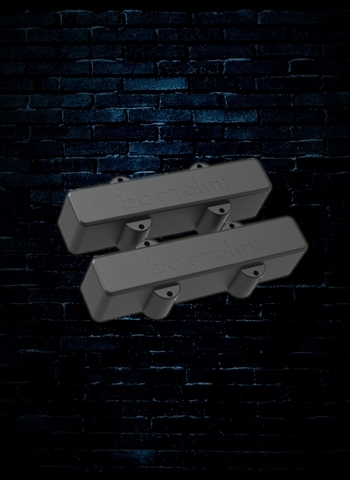 In this configuration it is important to use the "LN" (long neck) pickup that is specifically designed to work in this position (do not use a bridge pickup in the neck position). Some (very few) use two 'short' neck length pickups. Please check the physical size of the pickups you want to replace to make sure the replacements fit properly.